BIG BRAIN, a super computer made by Humanoido is a giant intelligent machine, the largest in existence at the Lab. Ten years in the making, living and semi-cognizant, it has over 240,000 processors/ technology expansions. Join us in this exciting adventure as it continues to grow, explores the Universe, creates its own projects and expands its dominion into the unknown and worlds beyond! Start by clicking the ABOUT tab. PART 3 - The newly formed Radio Telescope Observatory Laboratory is working with two receivers for intercepting radio signals from stars, planets, and a Tiny SETI program designed to detect other civilizations across our galaxy. First we will examine a $10 ten band radio purchased and made in China. This is a Panda model 6110 that runs of two AA batteries. Eight bands center on the shortwave spectrum while one band is FM at 76 to 108 MHz and MW covers 525 to 1610 KHz. The radio covers a total of shortwave bands ranging from 5.85 to 21.95 MHz. The plan is to get the system up and running by solar and Jupiter observations and then fine tune the results for deep space and Tiny SETI Potential programs include the Sun, Jupiter, Aurora, Lightning, Meteors and SETI deep space. There is also a sub program to design and create a 5-inch refractor telescope on the antenna as an optical calibrating and spotting finder telescope. Useful free online frequency converters, convert MHz and KHz to meters, m.
First we need to examine only the radio waves that can penetrate the Earth's atmosphere. This is in the range of around 5KHz to over 300 GHz and equals wavelengths from a few millimeters to nearly 100 meters. The Earth's ionosphere will reflect radio waves back into space at a frequency below 18 MHz and thus these signals are not detected at the Earth's surface. Decametric radiation is in the range of 3 to 40 MHz, which equals wavelengths of 10 to 100m. Decametric means tens of meters. Jupiter and the Sun may be detected anywhere from 18 to 28 MHz. Tune to the unused portions of the shortwave bands. LIGHTNING The point at 18 MHz, lightning is heard along with strong interference from manmade radio sources, and this reduces the chance of detecting extraterrestrial sources. JUPITER DETECTION For Jupiter, the probabilities of detection drop sharply at frequencies higher than 24 MHz, because of the drop in intensity of the emission. So somewhere around 21 Mhz is commonly thought to be the best band for listening as it is well above the ionospheric cut-off frequency and generally free of man-made interference. THE SIGNAL from the receiver can be recorded on a computer, digital recorder, cassette recorder, or iPhone. This project uses apps from iPhone 4 and iPhone 5. "In reading about the Leonid meteors shower, which I believe is supposed to peak today, I picked up tidbits that I never knew. For example, using a FM radio (regular broadcast rcvr), you might hear quick, short burst of a distant station punching through with presence of meteors. The recommendation I read suggested tuning somewhere at the low end of the dial, where you are not hearing a station. Since FM radio does not follow the curve of the earth, FM stations have limited range. However, the ionized trail of a meteor will provide a brief medium for these radio waves to bounce off of. I think the term is called "pinging". Anyway, the result can be a very brief blast of faraway station popping through." What shortwave frequency for "listening" to Jupiter? "One of the simplest things to get started with is to monitor Jupiter on the short wave band between 18 and 28 MHz which may be done as a School project or as an Individual. To do this go please to radiojove.gsfc.nasa.gov and download the hand books for the Radiojove receiver as well as the Radiojove Antenna. This will give you the basis to do a really good project. The antenna you may build using local components like TV Coax and wire. The splitter is a simple T piece with no electronics or phase switches in it. Simply bung everything together at best with a soldering iron and it will work ok. The Radio Jove Receiver may be purchased and is great fun to build up. I have built one and it is designed for beginners to build. If you do not want to build it you may use a short wave receiver tuned to a clear frequency near 21 MHz in AM Mode wide band..."
http://files.seds.org/pub/astro/SL9/jupradio/io_jup.radio "It appears that all one needs is a shortwave radio, 66" of stiff wire, 23" x 23" metal sheet (wire mess or aluminum foil), coaxial cable, wooden supports, screws and bolts. One can hear the Io/Jupiter interaction as well and meteors with this system. Robert Sickels says that Jupiter storms may be detected in un-used portions of the shortwave bands at anywhere from 18 to 28 MHz. When present at 18 MHz, say, they will not be found at higher frequencies. He says that Jupiter storms can be detected using a long wire antenna and a shortwave receiver like the Radio Shack SW-60. He shows a simple schematic to take the speaker output for input to a tape recorder and strip chart recorder. He says that many owners of shortwave receivers have already heard these noises but dismissed them without really knowing their origin..."
http://radiojove.gsfc.nasa.gov/help/faq1.htm "We study both Jupiter and solar radio emissions to better understand their magnetic fields and their plasma [charged particle] environment. Studying other planets always helps us better understand the Earth, and this is true when we study Jupiter's radio emission. Earth also emits radio waves by similar processes, so we can better understand this process by listening to Jupiter from both ground-based and space-based radio antennas..."
http://www.thrushobservatory.org/radio.htm "For casual observing, all that is necessary in the form of equipment is a shortwave receiver of good sensitivity capable of receiving in the 18 to 30 Mhz range. The 21 Mhz ham band is an excellent place to listen for Jupiter. 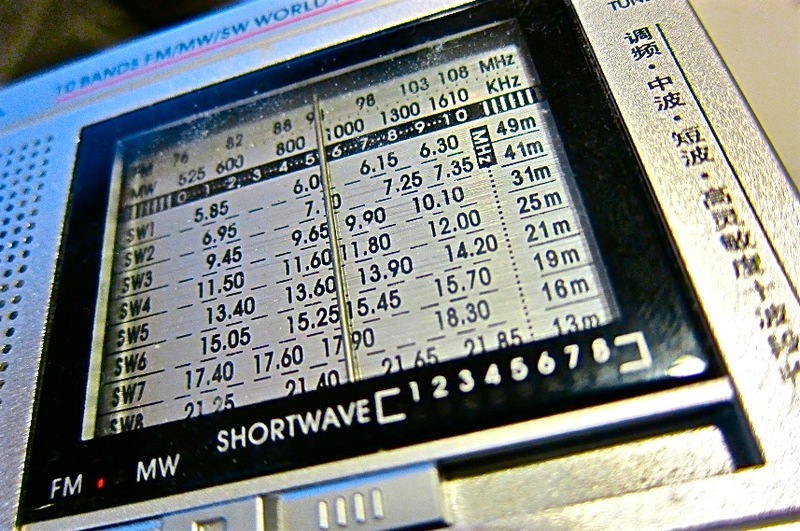 Some older shortwave receivers fall off in sensitivity at about this frequency. In such a case, a pre selective amplifier may be included between the antenna and the receiver. These preamps are available commercially or may be constructed from plans available in amateur radio publications. The antenna need not be anything special; a simple dipole will do. In fact, directional antennas may be a hinderance if they cannot be tracked as Jupiter changes position in the sky. A somewhat better antenna system would include two dipoles, switchable from the operating position. one dipole would oriented north-south and the other east-west. Suspending the dipoles approximately 1/4 wave above a wire poultry netting ground plane may help in reception when Jupiter is near the zenith. If a directional antenna such as a 3 or 4 element yagi is used, then it may be helpful to tilt the antenna upward, perhaps 3O degrees or so, to achieve a compromise in reception when Jupiter lies at higher elevations. Lowering the antenna to a few feet above ground can also increase the angle of reception..."
http://stargazerslounge.com/topic/170887-listening-to-jupiters-radio-emissions/ "Now that Jupiter is in our sky at night, it's a good time to listen to its radio emissions. This can be done with a shortwave receiver tuned to from 18 - 21 MHz during the night when this part of the spectrum is quiet (no ionospheric ducting of distant radio signals as is with the lower frequencies at night at this time of the year). What you are listening for is a background rush of noise that sounds like surf breaking on a distant shore. It will drift in and out slowly (several minuets) or quickly ( several seconds) from the background static noise level. The peak signal strength will be broad - about 1-2MHz wide - and can reach a signal strength of about "S-8" on a receiver's signal meter, with an outdoor antenna ( a horizontal dipole works nicely). Radios with built in antennas will pick up too much power line noise so the radio should have an outdoor antenna or be taken to a rural site (when you observe from a dark site) where power line noise is at a minimum. Any radio capable of receiving 18-22MHz will work and the mode that best hears the signals is SSB (single side band). Am will also detect it but not as well as SSB. And at other times of the year, when Jupiter is only visible during the day, the same signals can be heard as long as this part of the SW band is fairly quiet from broadcast signals, which they may be here during the summer months when this part of the band is "open". So as long as Jupiter is in the sky (day or night), you should be able to hear its radio emissions quite easily... just tune where you hear no broadcast stations or other man-made transmissions. The antenna does not have to be pointed at Jupiter at all. As long as the antenna (or radio) is outside a building where not much power line noise is evident, you should hear the signal. As long as Jupiter is within sight (even when cloudy), the signal should be heard especially at night when that part of the SW spectrum is usually dead..."
This output merely expands upon the last one to enable you to damage your iPhone as well as your laptop. I must confess, I have not tried this one yet, because I'm a little more concerned about damaging my iPhone, but I will try it at some point, when I have time, as I'm sure the risk is minimal. Having built Output 2, simply connect the audio cable to the 3.5mm audio output on your satellite finder, and use a 1/4” audio jack adapter to connect the other end to an iRig. The iRig is a component designed primarily to enable people to play the guitar through their chosen iGadget. There may be other connectors available that will enable you to feed the signal into the iPhone, so do feel free to look for something else if you wish, but the iRig is the most common one, which is why I mention it here. You can then download an appropriate app for the iPhone to analyse the incoming signal on your phone rather than your computer. Searching the App Store for 'sound analyzer' or 'oscilloscope' should bring up various results of use. Some of them are quite expensive (by iPhone App standards), but will be worth it if you wish to impress people with your new iPhone Radio Telescope attachment. (c) Humanoido. Awesome Inc. theme. Powered by Blogger.